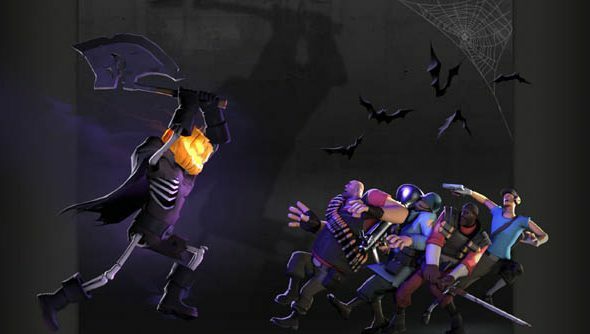 You won’t miss Halloween in Team Fortress 2 when it comes – there’ll be an exceptional comic, and a funny blog post, and maybe one of those webpages that changes as you scroll through it. But if you like, you can start early. Valve have pushed out a new TF2 update that unlocks the use of spells and cosmetic items usually reserved for the holiday. Halloween spells can now be turned on permanently by map authors, or enabled and controlled on servers. It’s a step beyond the optionalEternaween server enchantmentValve implemented at the end of last year’s event. Map authors will need to set the flag ‘HalloweenSetUsingSpells’ via HolidayEntity – while server hosts can use ‘tf_spells_enabled’ and ‘tf_player_spell_drop_on_death_rate’ via ConVars. Play on a server that has Halloween Spells enabled and you’ll be able to equip the Spellbook Magazine introduced last year as a base action slot item. What’s more, Valve now allow players to wear event-restricted cosmetic items on Halloween maps outside of Halloween and Fullmoon events. So there’s no reason for like-minded All-Hallow’s-Heads to wait the week or so until the big night, if they’re not inclined to. Do you think you’ll participate in this year’s Scream Fortress? Valve have fixed an almighty TF2 exploit ahead of the occasion.